Because we love the mountains and everything they have to offer, we would like to make the most out of each day by offering daily snowshoe hikes, cross country skiing and the chance to experience the surrounding alpine nature. We always combine this adventure with morning yoga, suited to all experience levels, under the guidance of our in house Yoga teacher. If skiing or snowboarding is your preference, then we are in close proximity to the piste and the ski resort. If you are an adult wanting to learn to ski or an experienced snowboarder/skier wanting to do some Splitboarding and ski touring, then check out our specialist weeks. An average ‘WearActive’ day may look like this: Yoga looking out at the sunrise behind the mountains before breakfast. 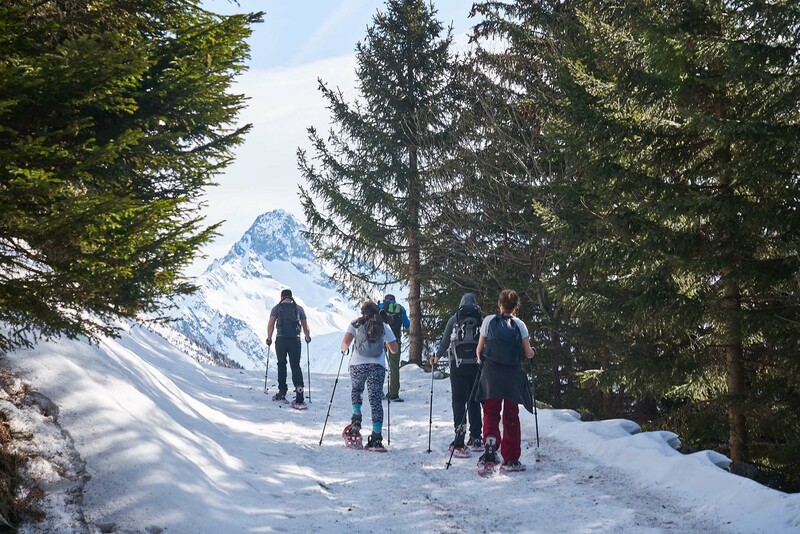 A guided snowshoe hike in a high alpine valley, with views of GrossGlockner, Austria’s highest mountain. Today we decided to take a picnic to maximise being outdoors. Return to MoaAlm where post activity ‘Tea & Cake’ awaits, maybe after join Craig for some inversion practice (he likes to spend a few minutes upside down each day). The wood fired hot tub has been lit so it’s time to soak those muscles as the evening light dances on the surrounding peaks. A super tasty & nutritious whole food plant based (WFPB) 3 course evening meal awaits us, where we chat and hopefully giggle about the days adventure and then plan for tomorrow. Having said all that … at ‘WearActive’ we don’t do ‘average days’ … whilst the majority of our daily guided activities are snowshoe hikes, we also like to explore other modes of mountain transportation. Occasionally the whole group is off snowshoeing with our guide, but more often than not some guests take a couple of days skiing in resort, or trying out cross country skiing. Maybe even a day ski touring if the weather is kind. It’s all about being active and outdoors. 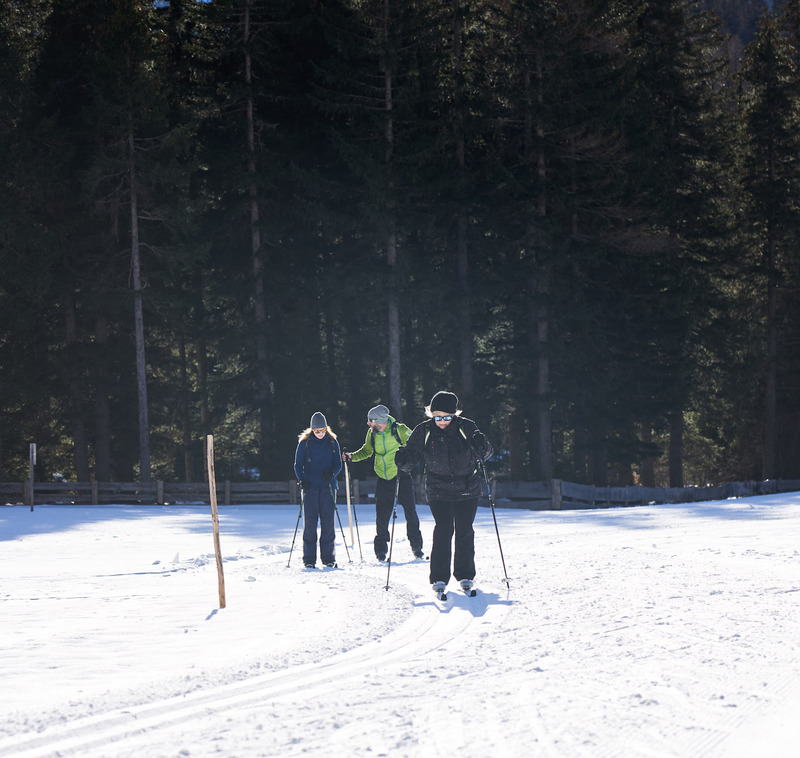 We offer daily guided snowshoe hikes to allow you to really get the most out of your Austrian mountain adventure. No experience is needed and we will provided all the equipment. Along with our guide, we will suggest daily routes, depending on weather, preference and your sense of adventure! If the visibility is great we will aim to hike up to a mountain hut for a picnic and then descend through the forest, making our own personal trail with the snowshoes. Whist snowshoeing is the focus of most weeks we do have access to some great cross country skiing terrain directly from the car park. If there is a guest preference to try some cross country then we will provide the equipment and guidance. Its often a nice change of pace and many guests enjoy trying something new, it's guaranteed to put a smile on your face! If you are experienced then we have a variety of blue and red routes in the valley and we occasionally venture further afield to try some more challenging red and black routes. Being one of the most snow-sure regions of the Alps, Kals is a perfect place to ski and snowboard. The GG-resort offers 40km of pistes that are suitable for skiers of all ages and with all levels of experience. There are no waiting lines for the lifts and the many restaurants on the slopes serve local specialities at friendly prices than most ski resorts in Europe. If you are moderate skier you can ski down to the chairlift in Grossdorf directly from MoaAlm. Never skied before? Don't worry we can arrange lessons for you. Prices for lift passes, equipment rental and ski lessons are generally lower than in most other parts of the Alps. Just remember that this is not included in your MoaAlm booking. Check-out the GG-resort website for details or contact us if you have any questions. At MoaAlm we love food! There is no better start of the day than a nutritious breakfast. We serve fresh fruits, oats & cereals, bread, nut spreads and bean spreads. After an active day in the outdoors you can warm up with a cup of tea and enjoy our freshly baked cake . At dinner our plant based three course meal will inspire and provide the perfect hunger solution after a days mountain adventure. We believe that food tastes best when it grows close-by: our ingredients are local, fresh and organic whenever possible. Read more about our tasty meals. For those interested in yoga, our certified yoga teacher offers a morning yoga class on 5 days of the week. You are very welcome to join whether you have never done yoga before or you are a regular practitioner - classes are always tailored to individual needs. Our yoga teacher specialises in Hatha yoga and occasionally teaches a Restorative or Yin yoga session in the afternoon or a guided meditation on request. In our fully equipped in-house yoga studio we have yoga mats and props, so you only need to bring some comfortable clothes that allow you to move freely. Read more about yoga at MoaAlm.